Mike Pembery, Technical Manager, Sensient Colors UK Ltd, looks at the color challenges facing manufacturers of household cleaning and fabric care products. 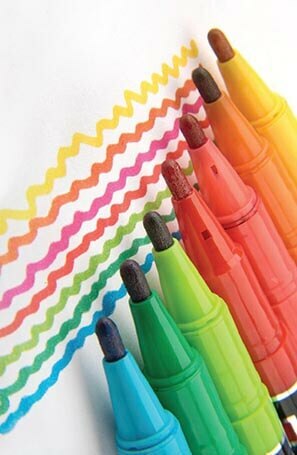 Color is a key ingredient in many household cleaning and fabric care products. Marketers use it to create distinctive brands, to emphasize product qualities, and to enhance the customer experience. For example, a particular shade of blue might denote the hygienic properties of a household cleaner. Yellow fabric softener can stimulate consumers’ senses so they perceive the product’s floral perfume to be more intense and evocative. But color has a secret: many standard acid dyes do not rinse away completely in water, leaving a residue that can, with repeated exposure, slowly discolor the fabrics and hard surfaces the products are meant to clean. Manufacturers can face a trade-off between ‘rinsablity’ and cost when choosing dyes. Premium brands tend to use expensive polymer-based acid dyes because the molecular size makes the colors almost completely non-staining to skin. However, fabrics that become discolored can be difficult to bleach out. This leads producers of mass-market products to use standard acid dyes. Not only are they cheaper; any gradual discoloration of whites is seen as an unavoidable side effect that bleaching can sometimes solve. So, what do manufacturers ideally want in a dye? A highly concentrated alternative to standard acid dyes has to offer more than superior color consistency and non-hazardous ingredients. It has also to be both rinsable from skin and from common fabrics and hard surfaces at 40º C—and fully bleachable in domestic bleach solutions (should the need arise). Many manufacturers won’t switch to polymer-based acid dyes because they normally require complex product reformulation. 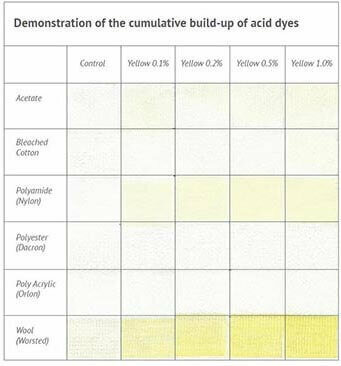 So any viable replacement for standard acid dyes would need to fit easily into current manufacturing processes, without a product reformulation or the addition of new equipment. Like standard acid dyes, any new alternative should be available in liquid form and must have low viscosity to facilitate ease of blending and dosing through standard pumps. It must also maintain minimal impact on the pH of a formulation, and offer the same palette of fully intermixable liquid colors, enabling manufacturers to provide marketers the choice of a wide range of custom colors, including black, with no gelling. Cost-effectiveness is also an important factor. A true alternative would have to be cost effective to compete with standard dyes while offering the superior color consistency and stability of polymer dyes. Marketers love bold colors to reinforce brand identities and perceived product functionalities. So they want the dyes they choose to be stable both over time and across a range of storage temperatures, particularly under commercial lighting, so as not to cut short the product’s shelf-life. Standard acid dyes are a popular choice among manufacturers of hard surface cleaners, fabric care products, household detergents, car washes, and children’s coloring pens. As such, any dye option must meet all REACH requirements and use readily available ingredients certified as safe for users and the environment. This includes being free from heavy metals, solvents, and preservatives, as well as being microbiologically stable to resist bacterial infection. Ideally, it should also be water-based so as to reduce environmental impact. For more information please read more about SensiRinse Plus™ or contact us to discuss your application.